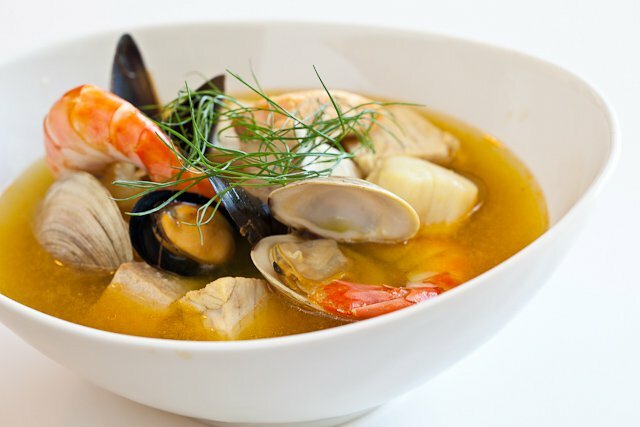 This recipe for bouillabaisse differs from most in two respects. First, my partner doesn’t care for aniseed flavours, so I leave out the fennel and the pastis that some would use. Second, I liquidise the soup rather than leave it with chunks of vegetable. This makes a beautiful ochre, orange coloured soup which I think soaks all the better into the crispy white bread which accompanies the dish. I like strong flavour. If you don’t, you might want to modify the amount of garlic and pepper. Serves 4, with enough over for soup during the week after all the seafood has been eaten. 300g non-flaky white fish cut in four; monkfish is ideal. Flaky fish like cod or haddock tend to disintegrate. In truth, you can use any fish you like. My practice is to go to the Mummery Bros stall and choose on the day from what the boys have. It’s always fresh and good. Sweat the onions, leeks and celery in the butter and olive oil until softened. Add garlic for a few minutes. Add stock, wine, saffron in its water, tomatoes, puree, parsley, orange and zest and boil gently until everything is properly soft. Add the salt and pepper. Liquidise then taste. Adjust salt and pepper. You can leave this until ready to eat, reheating when guests are seated. Once hot, add crab, then squid, then monkfish, then crevettes, with 30 seconds between each. Keep it bubbling. When crevettes are done, it’s ready. Set table with soupspoon, fish knife and fork and side plate. Set an empty bowl on the table for discarded shells and bones. Put a finger bowl and napkin before each guest. Serve from casserole into warmed large bowls with chilled dry white wine, a crispy loaf and butter. Enjoy.